Physicists have carried out successful teleportation with particles of light over a distance of 600m across the River Danube in Austria. Long distance teleportation is crucial if dreams of superfast quantum computing are to be realised. When physicists say "teleportation", they are describing the transfer of key properties from one particle to another without a physical link. The team has published its findings in the academic journal Nature. Researchers from the University of Vienna and the Austrian Academy of Science used an 800m-long optical fibre fed through a public sewer system tunnel to connect labs on opposite sides of the River Danube. The link establishes a channel between the labs, dubbed Alice and Bob. This enables the properties, or "quantum states", of light particles to be transferred between the sender (Alice) and the receiver (Bob). In the computers of tomorrow, this information would form the qubits (the quantum form of the digital bits 1 and 0) of data processing through the machines. 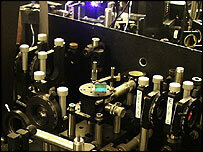 The Austrian team encoded their qubits using a property of light particles, also called photons, known as polarisation. This property describes the direction in which they oscillate. Quantum teleportation relies on an aspect of physics known as "entanglement", whereby the properties of two particles can be tied together even when they are far apart. Einstein called it "spooky action at a distance". The Nature study used an experimental method in which Alice performs a joint measurement on one photon in the entangled pair and on an "input" photon. As a result of this measurement, Bob transforms the quantum state of the other photon in the entangled pair into that of the input photon. The researchers were able to teleport three distinct polarisation states between Alice and Bob via the fibre-optic cable through the tunnel. The significance of this research was that it took place under "real world" conditions. "The really interesting question for us was whether we could do this outside a lab setting, in the environment used for today's fibre-optic communications," co-author Rupert Ursin of the University of Vienna told BBC News Online. "This is very important if you are talking about investing money in quantum communication." Quantum teleportation could be harnessed for fast, powerful computers or communication networks. In the underground sewer pipe tunnel, the fibre-optic link was exposed to temperature fluctuations and other environmental factors that could interfere with the process. Nicolas Gisin of the University of Geneva, Switzerland, successfully teleported quantum bits, or qubits, between two labs over 2km of coiled cable. But the actual distance between the two labs was about 55m. Mr Ursin said a next step towards worldwide quantum communication would be to attempt the teleportation of quantum states between particles using a satellite link. "The first thing you will need to do is find out whether you can have entanglement over such long distances. But teleportation will be one of the next goals," he added. The researchers were also able to double the efficiency of teleportation using linear optics.